Pattern Sizing: 4–12. I made a 10. Were the instructions easy to follow? I was actually going to use Sandra Betzina technique of bagging the lining, but this requires one to add a center seam in the back lining pieces. Since I had already cut out all of fabric without much to spare, I ditched this idea. However, I did end up following her sequence of completely constructing the lining, and then completely constructing the jacket and did not look at the instructions much. What did you particularly like or dislike about the pattern? I like the style, and I like the various collars and sleeve treatments. I did not like the way they have you finish the hem on the sleeves and the bottom. The coat is supposed to have a dropped lining, but I think I prefer to just sew the coat and lining so that they are flush, instead of the extra lining fabric I had at the bottom of the hem. 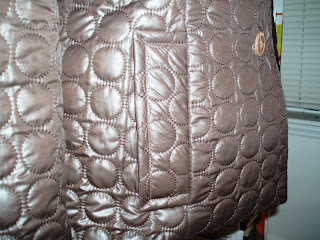 Fabric used: The brown quilted fabric featured on the pattern envelope. I found it at Jo-Ann’s for $14.99/yd. Thank goodness I had a coupon! 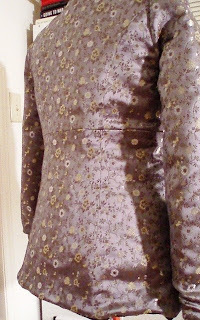 For the lining, I used a lavender brocade, also from Jo-Ann’s. Would you sew it again? Would you recommend it to others? Yes, I would sew this again. 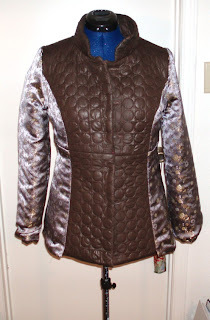 I want to use some of the components to make a light jacket like one I have seen in a department store. I would highly recommend this pattern to others.. 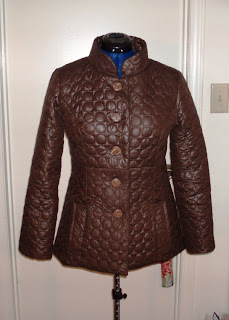 Conclusion: I needed a jacket for the fall, and this is it. I wore it on a day trip to King’s Dominion, and it ended up being the perfect jacket for the sixty degree weather. You go girl!! !I just love it!! You did some great work here! The jacket is Gorgeous. You did a fantastic job. THIS IS OH SO FAB!!!!! I am so in love with your jacket!!! I wish I could have found this material locally. The jacket looks fabulous!! I especially like the fabric you chose for the lining. What a kewl jacket! I love it! And you did a great job on the construction. The fabric was easy to sew but hard to press. Pressing took away some of the sheen, so I had be very careful. It looks so well made!! 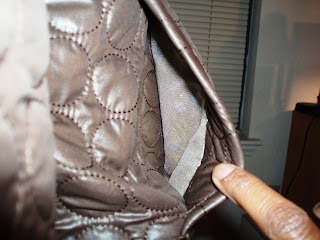 I love the use of brocade for lining. Great job! AWESOME job – well done! Was the fabric tricky to sew? Oh, I love love love it. Great jacket! Great jacket, I have had my eye on this pattern and fabric. You did a fantastic job. This jacket is not for sale.